Join the fun, sign up now! Come on out and play soccer, have fun, meet friends! The Phoenix Adult Soccer League was established in 2001 for the purpose to offer adult soccer on Saturday. There are no other Saturday adult soccer leagues in the valley that play in the morning and afternoon. The adult soccer league is sanctioned by the USSF soccer governing body so we follow the rules of the game. We take the extra steps to be a sanctioned soccer league to help maintain quality soccer matches for our soccer players. In addition we often attract various soccer clubs, individuals that are passionate about the sport. The adult soccer league has various skill levels. We have some casual soccer players and we also have ex-pro soccer players. On Friday night we offer coed soccer and then on Saturday we have a men’s soccer league that doesn’t have any restrictions and an adult men’s soccer league that’s geared to Over 35 players. We run a soccer tournament in December. The soccer tournament is usually coed soccer but on occasion we offer a men’s soccer tournament. We do not offer youth soccer in our league. Our liability insurance covers adult soccer players. If you’re looking for youth soccer then let us know and we can help you find a league. The links below are for our different soccer leagues. The Phoenix Adult Soccer League tracks goals scored for each division. We display the goal scorers on each web page. 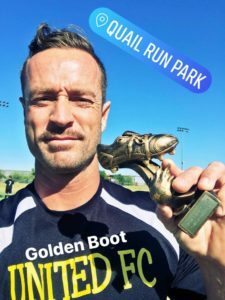 At the end of the season we award the Golden Boot, an award in soccer for the most goals scored, to the individual that has the most scores. Our soccer league is affiliated. That means our league is sanctioned by the USSF soccer governing body. One requirement they have is that we maintain rosters of our soccer players. The soccer roster can be modified for a short duration before we lock them down. The purpose for doing this is to ensure the soccer clubs do not recruit players from other soccer clubs in the league to build a dominate team. The goal for our adult soccer league is to have parity and make the games enjoyable, not to have one team recruit the best talent from each team. Every soccer team is required to get matching soccer jerseys with numbers on the back. We require the soccer players to have this in order to help our certified soccer refs with tracking the Golden Boot goals. In order to make this requirement convenient we partnered with Explosion Sportswear to make our soccer jerseys at a discounted rate. Our league offers several ways for soccer teams and soccer players to make their payments. Our primary method for collecting the soccer fees is using PayPal at our online store. If you desire we also accept Venmo for the soccer payments. We let the soccer free agents pay the league directly and credit whatever soccer team they plan to join. This allows our new soccer players a sense of ease knowing they’re paying the league directly instead of a soccer captain they have not met before. Playing soccer is a physical sport. We try to avoid the physical contact involved in soccer but players still get hurt. The soccer league only has liability coverage which covers the city, we do not provide full medical coverage for our soccer players. We strongly suggest each soccer player find suitable insurance before playing the game. Be cautious and get proper coverage, adult soccer is demanding on the body and the league is not responsible for injuries. Some fun soccer forms for our players and captains to complete.